List how much you spend on non-housing expenses by itemizing everything that you buy monthly - current bills, car payment, groceries, clothes, entertainment, etc. List everything except for your current rent or mortgage expense. Subtract your non-housing expense number from your take-home pay, after taxes (not your gross monthly income). The remaining sum is the maximum amount you should spend on a monthly mortgage payment. It’s possible to get pre-approved for a mortgage loan that is much more than you can comfortably afford, so this analysis a crucial step to take before dealing with a lender or real estate agent. You should know exactly how much you can pay on a mortgage and be prepared for the other expenses -- like homeowner’s insurance and property taxes -- that come with home ownership. If you haven’t already done so, this is also the perfect time to create a budget to assist you with the earnest money (a small deposit that is given to the seller at the time an offer is made), down payment and closing costs (including inspection and appraisal costs). Many first-time buyers are shocked at the amount of funds they’ll have to provide throughout the entire home buying process. You will also want to have some funds stashed away for emergency repairs, routine property maintenance and all the other expenses that come after you take ownership, so start saving as soon as possible. KNOW YOUR FICO CREDIT SCORE. No need to start house hunting if you cannot get financing. FICO scores are used most among lenders to determine if you qualify for a loan. If your score is below a certain number, you may not be able to get pre-approved and will need to take measures to improve your scores. Reviewing your credit report allows you to see what is being reported to the three major credit bureaus (Transunion, Equifax, and Experian) by your creditors and shows what items are affecting your score – good or bad. The major credit bureaus are required to provide a free copy of your report once every 12 months, so you can obtain a copy from each bureau to see what is showing on each one. 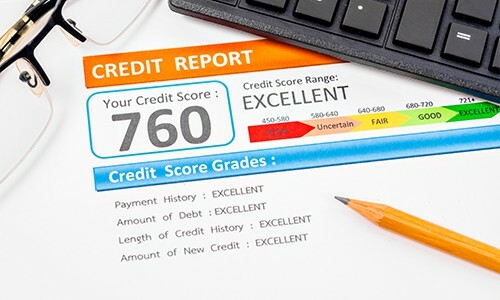 Or for a complete report on your credit history showing scores from all three bureaus, signup with one of the many popular credit reporting sites like creditkarma.com or myfico.com. Check your credit history for accuracy and report any errors or file a dispute on an item as soon as possible. GET PRE-APPROVED. Research several types of mortgages and learn about various mortgage loan options like Conventional, FHA, or ARM (Adjustable Rate Mortgage) so you can determine which program is best for you. Also, check government sites in your state to see if there are other loans or grant programs you may qualify for to get financing or down payment assistance. Next, review several types of financial institutions, including mortgage brokers, traditional banks, credit unions and government lenders to learn about their services, the interest rates offered and fees involved. The rates and fees can impact your monthly mortgage payment. Each lender will offer something different, so choose the one with the best options for you. The lender that you choose will provide information on suitable loan programs based on your current financial status and give you details on the down payment you’ll need to make at closing. They will also review your financial background and notify you of any problems that need to be addressed - like too much debt or low credit scores. If you qualify, you should get a pre-approval letter with the loan amount for which you’re approved. However, don’t let the loan amount steer you into a mortgage that is too much for you. Compare the lender’s maximum loan amount to the number you came up with after doing the budget exercise (mentioned previously) and use the lesser of the two as your spending guide. The pre-approval letter lets sellers and real estate agents know that you are a serious buyer and they will be more eager to work with you. START SHOPPING. Now that you know the price range of the home you can afford, you should have an idea of what type of home you’d like to purchase. Create a list of everything you want and identify your “must haves.” List details that are important to you like the number of rooms, preferred location, style of the home, square footage, etc. Having a list of what you want in advance will narrow down your search and help target property listings that match your search criteria. 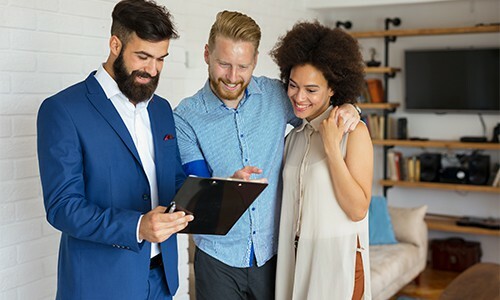 The U.S. Department of Housing and Urban Development recommends that first-time home buyers work with a real estate agent to help them navigate the home buying process. An agent will use your criteria for a home and match it with the Multiple Listing Service (MLS), a database of properties on the market, to provide a list of homes that may meet your needs. They can also help coordinate visits to the properties you want to see, assist you during the negotiation process (including helping you evaluate the seller's asking price and determine an offer amount by using recent sales data), and negotiate with the seller on your behalf. If you are purchasing government housing (such a HUD home) you are required to use an agent. Working with an agent does not mean that you cannot continue to search or visit properties on your own. Other resources like real estate websites (i.e. realtor.com and Zillow.com) are good for previewing properties online. Some sites have virtual tours, video content and other features to help you screen properties before you arrange a visit. Traditional methods, like looking for “For Sale” signs and visiting open houses, are also effective ways to find your new home. If you find a property you’re interested in while looking on your own,, provide the details to your agent so that he or she can get specifics about the listing and assist with negotiations if you decide to make an offer. As you visit multiple homes, bring your checklist of search requirements with you. Take pictures and keep a record of details on each house so you will be able to recall the specifics of a particular home later when you're comparing one house to another. Keep in mind that neighborhoods affect property values, so consider the neighborhood as well the house. The home may meet some of your basic needs, but pay attention to any factors that may be less than ideal for you. If the house is located on a high-traffic street or the surrounding properties are not well-kept, that may be a deal breaker and should be taken into consideration when making your choice. Narrow down the list of homes you want to revisit and use the details you’ve gathered to determine if you want to make an offer on one of the homes on your short list. MAKE AN OFFER. You found the perfect home and are ready to make an offer! Your agent should be able to walk you through this part of the process, but keep in mind that time is of the essence, so do not wait too long to make the offer. The offer is usually prepared by your agent on contract forms, but an offer is not a guarantee that the home is yours. It is just a notification to the seller that you are willing to abide by the terms in place to purchase the home. Base your offer on the market value of the home, not the list price. Market value is based on the price at which other comparable homes in the area have sold. Make a lower offer if the house needs a lot of repairs, is in an area with an abundance of homes for sale or has been on the market for quite some time. The seller might be highly motivated to sell and will be willing to negotiate on the price. Your written offer should include the offer price, a closing date, the amount of earnest money you are putting down and the length of time the offer is valid -from a few days to a week. Include any contingencies to cover any concerns you may have, such as the return of the earnest money should the deal fall through. The earnest money serves as damages in the event that you default on the contract. This is refunded at closing and is applied to the overall cost to the buyer. The seller can opt to accept the offer, make a counteroffer or reject the offer. If they make a counteroffer, they want to amend some of the terms but are willing to negotiate. If they reject it, you can still negotiate with the seller but you may need to raise your offer to reach an agreement. If any amendments have been made to the original offer terms, make sure it is documented on the final sales contract. Once you have reached an agreement, you and the seller will sign a sales contract which will become a legally binding purchasing contract. Submit the fully executed sales contract and earnest money to the title company so they can start preparing for the closing. They will ensure that there are no liens on the property and it has a clear title. The buyer and seller will be notified if there are any issues with the title. Get a home inspection. In the contract, there should be an option for you to terminate the contract for any reason within a specific number of days. During this period, hire a reputable home inspector to provide a detailed report on the condition of the home and identify any potential hazards to prevent you from buying a lemon. 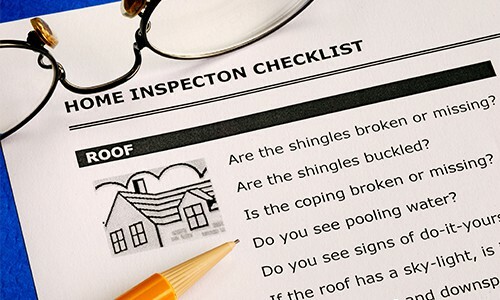 It is not mandatory to hire an inspector, but it is recommended to have the home checked to make sure it is in livable condition before buying it. If there are items in the report that require the seller’s attention, provide an amendment to the contract and request that the seller addresses those items. If you are borrowing money for your purchase, return to the lender to turn your prequalification into an actual mortgage loan. You will need photo IDs, Social Security numbers, tax forms and tax returns from the past two to three years, most recent pay stubs, bank and retirement account statements and your addresses for the past five to seven years. 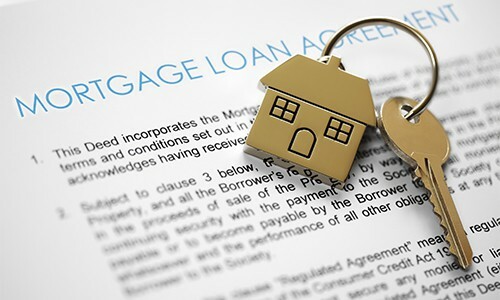 If you are using your own money to buy the home and do not require a mortgage, send the seller a proof of funds letter from your bank and any other documents they may require. You will go through a final credit approval that can sometimes take several weeks. Make sure your finances are in order and be prepared to pay additional fees for a credit check, application, and appraisals. Refrain from making any major changes to your employment or credit history during the mortgage approval process. This includes changing jobs, making a major purchase on credit or opening any new credit accounts. These could cause you to lose your loan approval. Your lender will order a home appraisal to determine a true value of the property based on market information. The appraiser’s job is to ensure that bank isn’t lending more money on the property than it’s worth. If the home value is less the contracted price, most lenders will not issue the loan unless the price is amended or the difference is made up in cash by the buyer. Work closely with your lender to get a complete understanding of your monthly mortgage payments and get an estimate of how much money you will need to bring to closing. These costs usually include your down payment and closing cost (which typically include fees from your lender, title company and possibly your agent). SEAL THE DEAL. Once you’ve been notified that you are clear to close, it is time to head to the closing table. A few days before closing, you will do a final walk-through of the home with your real estate agent to ensure there are no damages and that any requested changes specified in the contract were completed. Review the final HUD 1 settlement statement sent by the title company. This statement is a detailed outline of all your expenses for the home and the “cash to close” amount you will need to bring with you on closing day. Bring all the necessary documents, a cashier’s check or money order to pay closing costs and a valid photo ID with you on closing day. It is highly recommended that you gather all the items a few days before closing so that you are completely prepared for the big day. Be prepared to sign a lot of documents and make sure that you read them carefully before signing them. After you sign on the dotted line on the last document, you are officially a homeowner! Congratulations, now it’s time to get ready for moving day! Visit our Moving Hub for more tips on what to do after your closing day and how to prepare to move.